That's according to The State Of The App, a report by McPheters & Company comprised from its iMonitor database of information about 4,000 news and magazine apps. That makes Nook Newsstand and Zinio the second most popular platform for publishers after iOS (not including the web). And Nook added the most publishers between May and August. Where does that leave Android apps? Still languishing. only 21 percent of U.S. magazine publishers are currently distributing through Android apps, according to McPheters. However, it may be true to say that other platforms like Nook and Zinio are more likely to play host to replica page-turners than dedicated interactive app editions, as iPad editions are. "Unfortunately, the majority of magazine apps are still minimally enhanced PDF replicas, and it seems as if the advent of the iOS Newsstand - and perhaps the Kindle Fire - may be contributing to an increasing trend in this direction," according to the McPheters report. "The publications available on the Fire are likely to skew heavily towards replicas." McPheters founder Rebecca McPheters tells paidContent: "Since mid-October, we have seen a spate of replicas from publishers like Hearst and Time Inc. that had previously published mostly high-quality apps that take full advantage of the iPad's capabilities." Amazon have announced thatthe new Kindle Fire will include a “Newsstand” selling subscriptions and issues of 400 digital magazines and newspapers. Most of the major publishers on the magazine side will be represented in the Newsstand: Conde Nast, Hearst., National Geographic, Meredith, Wenner, Reader’s Digest, etc. Early customers will get a special promotion from Conde Nast, a three month free trial subscription to its 17 titles. Conde Nast is the latest magazine publisher to be boosted by Newsstand, the new feature in iOS 5 that lets you buy and read magazines. Since Newsstand was launched on the iPad, several Conde Nast titles have seen sales soar. According to Electronista , subscriptions to magazines like The New Yorker and GQ have skyrocketed by a whopping 268 percent in the two weeks since Newsstand launched with iOS 5. Single-issue sales have also benefitted, making a 142 percent jump. Conde Nast executive vice president of marketing Monica Ray told Electronista that Newsstand’s design has helped. Placing the app on the home screen has given “focused attention” to Newsstand and made it simpler for people to access magazines. This exposure seems to be invaluable for magazine publishers, most of whom have struggled to get people to read their products on the iPad. Magazines Flex Their Apps -- But Will They Make Any Money From Them? As the man tasked with giving new life to magazines on new platforms for Condé Nast, Scott Dadich says there are some things, old-school things, that don't change whether you're dealing with print or tablets. In an effort to differentiate its upcoming TouchPad tablet from competitors like the iPad and Android tablets, HP today announced that it would launch a digital magazine to accompany the device, made to showcase apps for the operating system, webOS 3.0. HP describes the magazine, called HP Pivot, as an "entertaining and informative editorial resource for discovering webOS 3.0 applications." 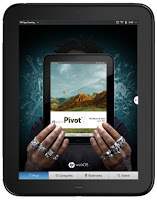 Besides reviews of apps, HP Pivot will profile top developers, HP said in a press release. The editorial will include original content from journalists associated with various publications, including The New York Times, The Wall Street Journal, Vanity Fair, Fast Company, New York magazine, Harper's Bazaar, Tattler and more, an HP spokesman told PCMag. Condé will actually beat rival Hearst in the iPad subscription derby. Hearst said yesterday it was going to start selling subscriptions and single copies of Esquire, O: the Oprah Magazine and Popular Mechanics via the iPad effective with the July issues, available sometime next month.